Summer is coming to an end in many places in America as well as the rest of the world, but Southern California is warmer than ever. 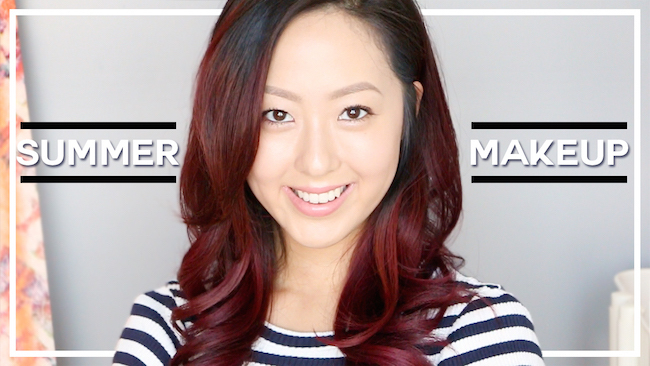 We have been hit by a major heat wave, so it is perfect timing for this sweat-proof makeup tutorial! Many of you loved the natural looks I wore in my Tokyo travel vlog, so I partnered up with Clinique you bring you a more accessible, affordable — and even easier — take on the makeup. I hope you enjoy the video! In ultra humid and hot conditions like Tokyo and SoCal summers, I highly recommend keeping it light. I didn't pack all that much makeup because experience has taught me that wearing and layering too much would end up in a melted, splotchy mess. Start with a great sweat-proof foundation, like RMK's Creamy Gel or SK-II's Facial Treatment Cream Foundations (both Asia exclusives), and set with a loose powder or powder foundation depending on your coverage needs! Less is more in warm weather! I like to focus on my T-zone and keep it very sheer everywhere else. Use highlighters strategically to keep the complexion glowing since maintaining a super matte, flat foundation finish is unrealistic. Don't fight the climate! Instead, mimic it while controlling it. When necessary, I will blot my nose with TATCHA's Beauty Papers and then touch up my forehead, smile lines, and chin with SUQQU's Pore Covering Powder. Stick to a glossy lipstick or a tinted balm for the complete laid back summer-lovin' effect!